The amount of money that is being brought into the household does not matter as much as how the money is being managed. Managing money means knowing where each penny is going. The most effective method of keeping track of a household budget is using a personal monthly budget template. With just a few clicks of a button, you can add in your household expenses and have the calculations completed for you. If you are interested in getting on track financially, a budget spreadsheet can increase you financial knowledge and get you on track within one month. • The monthly budget spreadsheet is created in an Excel format, simple and ready to use. To get started, all you need to do is download the spreadsheet from our website. This personal monthly budget template has columns for any and all monthly household expenses. From food, to mortgages and rent, to debt payments, to movie trips, there is a row to perform budgeting for all expenses you may incur. 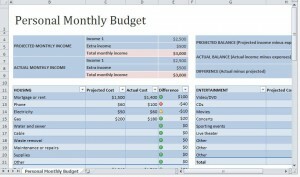 • The budget template is available for download through Microsoft Excel. Since the majority of computer users own Microsoft Office, or its equivalent, this free template is usable for all of the public. • The best thing about this template is that it is 100-percent free. No need to pay for financial advisement or pay someone else to keep your records together with this template. • The spreadsheet will let you know how much you spent in each category, the difference between what you planned, and how much is actually going in and coming out each month. With the personal monthly budget spreadsheet there is no more guess work in how much money is spent or leftover. Follow a few simple steps to use the personal monthly budget template as a basis for your household needs. 1. Enter your expected income in the “projected monthly income” column. Include all income sources in the assigned box. 2. Map out your planned expenses in the projected costs box. For your fixed monthly expenses like rent, insurance, and car payments, this amount will be easy to plan. For monthly expenses such as food, entertainment, and gas, use the income after your fixed expenses to properly assign an allotted amount to these boxes. 3. As the month goes on, add the actual expenses that you pay out into the actual column. The last column in the row will show you the difference between what you planned and what you spent. 4. For the next month, use your projected expenses and your actual expenses and income to adjust your budget to zero budgeting. Zero budgeting means that every dollar is accounted for in the budget. A zero budget coming out in your favor means that you have completely taken control of every dollar of your income.